← Resolutions time… or not. 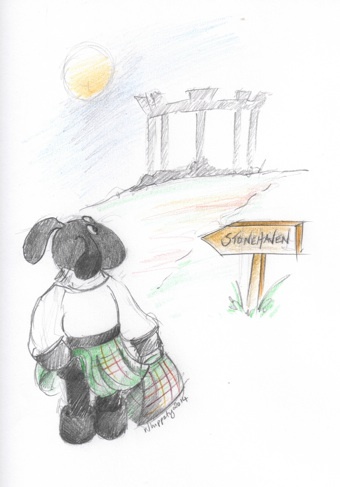 I had hoped Wee Black Faced Sheep would return to Stonehaven at least a week ago…….he almost did…..but then came a detour via the Shetland Isles to pick up a couple of balls of yarn from Jamieson’s. Do you remember some time ago I mentioned how I had a problem with purchasing only one ball of yarn at a time? This habit can be particularly annoying when there is a deadline to meet and that one ball of yarn runs out! 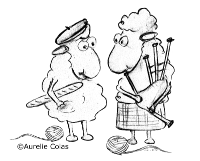 This entry was posted in Burns Night, Burns Supper, Child, Design, haggis, History, Knitting, neeps 'n' tatties, Robbie Burns, Scotland, Scottish Traditions, Tartan, Toddler, Toy, Travel, Uncategorized and tagged Burns Supper, design, history, knitting, love, Robert Burns, Scottish history, Scottish traditions, Scottish yarn, sheep, sketch book, Stonehaven, toy, Wee Black Faced Sheep. Bookmark the permalink.